Taking care of your aging parents doesn’t have to be daunting. It simply means they don't have to figure things out alone. 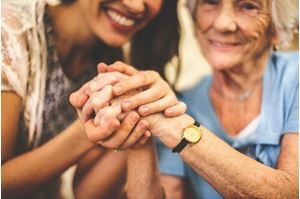 My pH Advocate gives the elderly patient a shoulder to lean on when wrestling with challenging health issues such as a new diagnosis, conflicting medical opinions or poor outcomes from treatment. Our advocates provide the elderly patient peace of mind and a sense of having things under control. Most importantly, advocates serve as a guide to make sure elderly adults can focus on what matters most to them. Getting older shouldn't mean getting sicker. It should mean embracing new experiences. So, give us the worry and get back to the good ole days of the here and now. You can afford peace of mind, but you can’t afford a misdiagnosis. A misdiagnosis costs tens of thousands of dollars or more in frustration plus lost time and memories. Get a pH Advocate in your corner today by calling 855-745-2271. Helps patient avert misdiagnoses and medical errors with a second opinion from a medical team. Gives peace of mind to the patient who is confused or stressed about his or her diagnosis and treatment plan. Enables patient to stay at home as long as possible and recognizes the unique health and service needs of each individual. Ensures the patient fully understands what’s going on and is being treated fairly by doctors and health insurance companies. Reviews medication and treatment options. Gets patient back to their life and away from worry. We provide all the resources to make sure your health is the number one priority. pH Advocate evaluates the patient’s situation, diagnostic tests, medications and health insurance, and provides second opinion and recommendations, including recommending tests that traditional medical offices won’t or don’t have the expertise to suggest, which may give the patient a better picture of his or her health. pH Advocate works with a dedicated team of doctors and health care attorneys to protect the health of the patient and to help the patient better understand his or her health state and treatment options. pH Advocate can arrange for a personal advocate to accompany the patient to appointments or testing facilities, if desired. Certain situations require more than one opinion. My pH Advocate provides the elderly patient with education, one-on-one support and in-depth case analysis to promote increased understanding and better treatment outcomes, while preventing age discrimination. Questions? Give us a call, 855-745-2271, and breathe a sigh of relief. Your advocate is on the way.